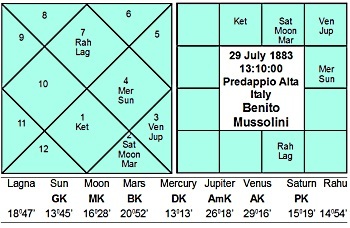 There is a clear difference in the Matrikaraka and Putrakaraka combination with aspect of Mars in the case of Mussolini as it occurs here in the eighth house with Moon, MK and Saturn PK being combined unlike Churchill and Hitler. Matrikaraka Moon and Putrakaraka Saturn with Mars are in Vrisha and its effect was known only in the dasha of Meena from where it aspects the fifth house. This dasha of Meena was from 1920 to 1929. In 1915 he married Rachele Guidi, with whom he had lived since 1909. Started living together with Makara (DK in seventh and Mesha DKN in the seventh). A question that must puzzle astrologers is whether to treat the time of living together when two people begin to live together, as an act nearly of a sacramental or legal or marriage for the purpose of timing. It is so in the case of hundreds of horoscopes I have seen and is so in the case of Mussolini. In Vimshottari dasha, this period could be Rahu Venus Mars since the date of their decision to live together is not known. Mussolini starting his political career as a socialist where he got the platform to distinguish himself as a journalist and a fiery orator with his dramatic gestures as a rabblerouser had switched over to fascism. The rajayoga of the Matrikaraka and Putrakaraka in the eight house aspecting the tenth house is clearly indicative of what in democracies constitutes the combination for a turncoat. That Mussolini was when he was expelled from the socialist party because of his differences over whether Italy should join the First World War or not. He switched over the fascist side and carved out his place in Italian and world history. Like all those who rose from grass roots and established themselves in the forefront of political life of their country here too there were three essential elements to succeed There were the ideas of fascism which he spread through his writings in which Italians were promised the revival of the “glorious empire” of ancient days: there he was embodying these ideas in his persona and there was his party and an ideologically committed army to help him capture power. Hitler of Germany had become his admirer. It happened in Meena Mithuna which have his excellent rajayoga producing karakas, AK and Amk. In the subsequent dashas of Mesha (1929-30) it aspects the tenth house and in Vrisha period onwards it continued, till Mussolini reached the dasha of Tula( 1937 to 1945) from where this fell in the eighth house of his fall, disgrace and death along with his mistress as Darakaraka Mercury in Karka aspects this combination in the eight house. The result of good dashas from Meena to Tula was that Mussolini ruled Italy like a dictator for twenty one years from 1922 to 1943 unlike the twelve years of Hitler.